Keep the old, but be generous with new. Fundamentally the editor of the New Sonatina Book has followed this principle. 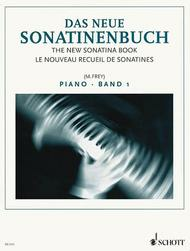 Therefore in the book are found sonatas for children which are almost “classical”, as well as other works which have long been used successfully in teaching the piano but which are not found in previous collections such as, for example, the Vienna Sonatinas of Mozart which acquired fame so quickly in the new Schott edition, the charming Spring Sonatina by Handrock, some melodious compositions of Theodor Kirchner, and as a contemporary work Gretchaninoff's Sonatina which has proved itself as a splendid display pieces for pupils' concerts. The collection is as far as possible arranged in order of difficulty, but as frequently different movements of a work demand different levels of technique, a completely logical sequence was not possible, particularly as the individual talent of the pupil plays an important part. In order to acquaint pupils with polyphonic music some easy pieces by Handel, Telemann, Krebs and Max Reger (Canons) have been included. by Mozart I've never seen elsewhere, the Spring Sonatina by Handrock, and a great sonatina by Ludvig Schytte. Also included are more familiar composers like Clementi and Kuhlau, but the included selections are among their best (along with a few cliches). The editor, Martin Frey has excellent taste. I have numerious classical music books, but this one iof the best in terms of quality of selection.